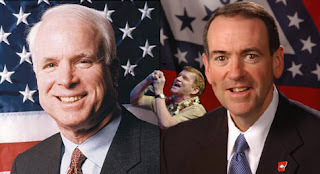 I find the dishonesty between McCain and Huckabee about their back room deal for West Virginia really disgusting, especially considering Huckabee is supposed to be a “man of faith”. However this is also not a surprise to me either based on how many Evangelicals act (of coarse not all). The attacks by Evangelicals on Romney are ridiculous and this is also more proof of the hate that Baptists have for others that do not fit their image. Huckabee is a one issue candidate and I really doubt his views are any better than anything Romney believes yet this does not matter to so many as image is everything to so many Evangelicals. Worse Huckabee comes across a typical “hide your head in the sand” or “hear no evil, see no evil” Evangelical based on his world views (as to the dangers and intentions of Terrorists) and even his social views. If you want to get down to religion even though I have disagreements with Mormons on many theological issues, who really embraces the spirit of Luke 10:25-37, Mormons or many of Huckabee’s ilk? Personally as the leader of the United States I would prefer the prior based on this passage alone. Sadly when commenting on an official Huckabee website about his actions against Romney and his carefully crafted image, his minions attacked me on a personal level that showed that they did not even read my "Bio" page that I posted with my comment that showed where I had been in life and where many Baptists with his views turned their backs on my family. Sadly, so typical of persons of his/their ilk! I am not an Evangelical (I used to be) but after witnessing the hypocrisy and down right evils in Baptist Churches in particular (try and convince a Baptist of the importance of Luke 10:25-37 and they totally miss the point as image is everything)., minionswith Huckabee on the ticket. That said I could even vote for Clinton, knowing that her abrasive personality will not get everything done that she wants. And at least what you see is what you get with her. On the flip side an Obama candidacy might make me still vote for this combination as he has been as bad as Huckabee at pulling the wool over Democrat’s eyes as Huckabee. With his slick personality I worry much more about him than Hillary not to mention when it comes to dealing with terrorist threats she has at least demonstrated in the past some sense of the dangers while he has not. At another forum I frequent another stated just this same sediment that he actually scares him more as he is well left of her in his socialist views and his slickness allows him to get away with this which in my opinion makes him a far more dangerous person than Hillary despite what many conservative say (even Rush Limbaugh). As well, disliking Obama more than Hillary does not make me a racist despite what a person who blindly supports Huckabee accused me of in a forum (this is what Huckabee has in common with Obama; slick packages with some bad ingredients inside). Even my local Republican politicians (past/present) show similar arrogance based on their so-called faith and will look the other way when truths are presented to them that they do not want to hear based on the image they want to project. It is looking like I will not be voting for a single Republican on the ballot (local/national) for the first time in my life, although if McCain can mend fences with Romney or tap Thompson for VP, I still may vote Republican at least for President. I find the love affair with Google down right sickening. Yes Microsoft certainly has not always used ethics in its business dealings, but at least they have battled those who can afford lawyers and can call notice to actions via the media. I will also note that as a person with three special needs children (and paying a heavy personal and economic price for it) that at least Bill Gates is the number contributor to autism (from which my son suffers). Google on the other hand goes after the little guy with no voice or legal budget. I had an Adsense account a while back that had a day of malicious clicks (but not from us), Google well knows where the isp of these hits came from but they instead chose to take all my money that was built up in my account (I understand the questionable click money) all the while refusing to answer emails with anything other than form emails (then nothing). WORSE, as someone who has spent a lifetime in research in aquatics with many unique articles on the internet, Googles terrible search algorithm allows my plagiarized articles to come up in searches (right at the top) while my originals are often no where to be found. YET in Yahoo, DuckDuckGo, and Bing search my articles come right to the top and the plagiarized articles are no where to be found. GO FIGURE! Of coarse there is an easy answer; follow the money. These ripped of articles have Google Adwords or other adverts all over them while the originals do not. Also I have contacted Google about this and although at first they were helpful, they now refuse to stop this (the least they could do is fix their algorithm). I know many in SEO forums (who have flamed me in SEO forums for EVEN suggesting that the great and all knowing Google God could do this) would state this is not possible as these are two separate entities under the Google trademark, HOWEVER my answer to this is that this is REALLY hiding your head in the sand (which is common in cult like followings whether it be Google, politics, ignoring evil world leaders, or religion). Google has the knowledge and technology to make this happen. They also know how to make this happen in a subtle way (just like every other deceitful thing they do) so as to not draw attention (& lawsuits) to themselves, which one reason they go after small companies or less known article publishers such as myself. Google is certainly not stupid enough to allow a plagiarized from a CNN writer rise above the original just because it has Adwords content. The fact that Google uses authority links as part of their algorithm is one proof of this and another as to why their searches often yield crap at least in the Aquatics/fishkeeping research field (if CNN wrote an article about fish walking on land and working at CNN, it would rise above an article written by someone such as myself dispelling this myth). By the way a Yahoo Search on my articles site finds articles and keywords (out of over 300 pages) vastly better than Google, which often brings up spam site. Try searching “aquarium information” or worse "Planaria in Aquarium". In fact as far as the keyword search “Aquarium Information”, I wrote a companion site with VERY different spammy methods and content at the same time as my more serious aquarium information resource site, and guess which one does better on Google, yep the spammy one, while the spammy one is not to be found on Yahoo or MSN. With Googles nightmare Penguin/Panda Update, purely "cut & paste" SPAM sites such as "onedersave.com/blog" often come up to the top of search results! This site has no real SEO, no authority inbound links, yet is top in search results for terms such as "Planaria in Aquarium". By the way, this is not to say Google does not put out good products, they do (I am using Blogger here, in part because I have had this Blogger account way to long to go start over somewhere else) it is more that Google is not whom they pretend to be. In fact one other lie of Googles is what they tell Webmasters about back links: I have found that some of my highest rated back links on Yahoo and MSN are the very relevant content ones while Google (that claims to put much emphasis on content) gives my highest relevance to a few (high PR mind you) tech in bound links not to my more relevant links. Of coarse this goes hand in hand with how stolen articles of mine can show in a Google search while mu copyrighted content do not (and BTW, this is not to say I do not have search terms that do well in Google, I have many that I am in the top 5 or number even #1). Based on this love of Google and its corruption and what I and my family have been through, this is no surprise as we live in a very morally bankrupt world and I really fear for my children’s future. My wife, daughter and family were already harmed while persons with the power to help looked the other way! And untruths about me continue to circulate about me while others with the power to stop this look the other way as they are not willing to look for the truth in these rumors, so our family is subjected to poverty because of this.